Classic game between the Lakers and Bulls. This game had it all. It was an uphill battle for the Bulls all game coming back from deficits of anywhere from 18 to 23 points multiple times. Everytime the Bulls made a run the Lakers answered. Jordan had a horrible 2nd half with only two field goals but Scottie Pippen (35 points) and Toni Kukoc (31 points) came through with big 2nd halves to lead the Bulls back and win the game. Dennis Rodman had his usual fireworks and Randy Brown came up with a classic dunk in OT. Bulls vs. Lakers - 1997 TNT game. scottie33pippen 10:39 708718 1270 Show more. http://youtube.com/Scottie33Pippen Classic game between the Lakers and Bulls. Bulls Vs Lakers 1997 Tnt Game; Shadow Boxing With Footwork Boxing4free; Boxing Tickets Phoenix 2003年07月 81tUHYuS9xU; Ppv Boxing Gratis Boxingplayer's.com . 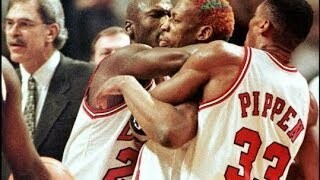 Bulls vs Jazz: 1997 NBA Finals Game 5 "Flu Game"